Software Professionals all over the world are passionate about Scrum. However, Scrum is not hype in IT industry. Scrum is an Agile Project Management Framework to develop great products that customers love. Who is a Certified Scrum Master (CSM)®? Many a time, a Scrum Master is mistaken for a Project Manager. The difference is that, while the Project Manager may also have people management responsibilities in addition to the role of a Scrum Master, a Scrum Master shall not hold any such additional people responsibilities. Why Certified Scrum Master (CSM)®? According to the latest data, the annual salary of a ScrumMaster now surpasses that of a Project Manager. 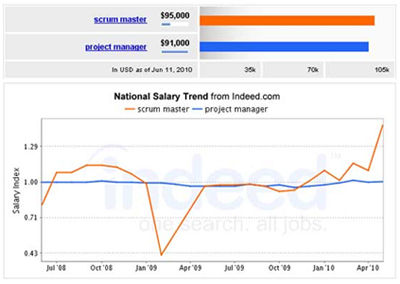 Even more surprising, is just how quickly the ScrumMaster salaries have increased in such a short amount of time. As you may remember, I performed similar job research in Oct 2009 when the ScrumMaster role pulled in around $88,000 a year. ScrumMasters now make on average $95,000 a year, which is a $7,000 increase. On the other hand, Project Manager Salaries seem to have become stagnant, showing no visible signs of improvement. Even the ambiguous Agile Project Manager salary seems to have hit a glass ceiling. With the Scrum Master in such high demand, can we expect these salaries to sustain this sort of growth in an economy that may be dipping into yet another recession?